Giving Back to the Multiple Myeloma Community | Patient Advocacy Improves Research and Patient Support | Celgene Corp. When Michael Tuohy was diagnosed with multiple myeloma in 2000, the only thing he could think about was living long enough to walk his then 7-year-old daughter Ally down the aisle and seeing his 2-year-old son Mikey graduate from college. At the time, multiple myeloma patients had just a 35 percent chance of living five years. But 17 years later, Tuohy is about to see his wishes come true; his daughter is planning her wedding for next year, and his son is now a freshman in college majoring in biomolecular science. Since his diagnosis, Tuohy and his wife, Robin, have seen a lot of positive advances in multiple myeloma treatment and support. 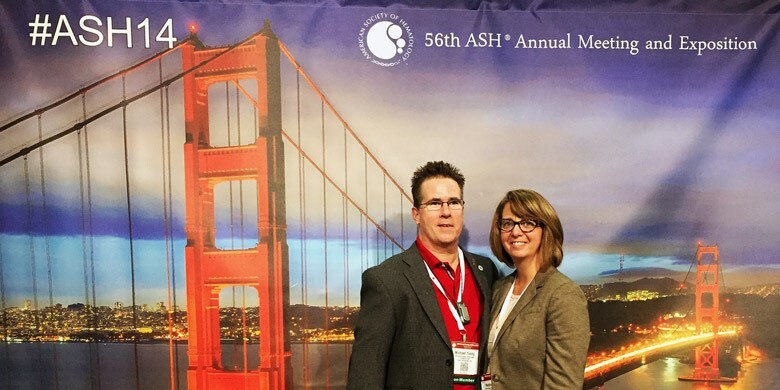 During this year’s American Society of Hematology (ASH) annual meeting, they are giving back to the community by sharing what they’ve learned. What has changed in the 17 years since Michael’s diagnosis? Robin: When Michael was diagnosed, his treatment options were limited. Now that there are so many more options, people should feel encouraged to talk with their doctors about what’s best for them. I also stress to people to stay fit and get all their check-ups. You have to keep your body in good shape. As long as you can stay healthy and take care of yourself outside of your multiple myeloma, those treatment options are your future. Don’t be afraid of your options. Michael: We’ve been going to the ASH annual meeting for a few years now. Lately, it’s been standing room only. Thousands of participants are attending the presentations to hear about the latest developments. It blows my mind and gives me hope for the future of multiple myeloma. SINCE MICHAEL TUOHY’S MULTIPLE MYELOMA DIAGNOSIS, HE AND HIS WIFE ROBIN HAVE ATTENDED MEDICAL MEETINGS TO LEARN ABOUT THE LATEST TREATMENTS AND SHARE THAT INFORMATION WITH OTHER PATIENTS. How did you become involved with the multiple myeloma community? Michael: After my diagnosis, we searched out the best resources and found the International Myeloma Foundation (IMF) website. Geraldine Ferraro had just announced she had multiple myeloma. The IMF was asking patients to write letters to Congress about battling multiple myeloma and the importance of funding research. Susie Novis Durie, the founder of the IMF, saw our letter and asked us to share our story in Washington that year. We both went, and it was the first time we met any other multiple myeloma patients. I had gone about six months without meeting another patient. We became empowered through the IMF and decided it was time to take action to help others. Why did you start a multiple myeloma support group? Robin: Connecticut did not have a multiple myeloma support group, and Susie suggested that we start one. But we weren’t the kind of people who sit around and whine. So we decided our group — the Connecticut Multiple Myeloma Fighters’ Information Group — would focus on empowering multiple myeloma patients and caregivers to have better-informed conversations with their doctors and to learn about treatment, side effects, clinical trials and the importance of seeking out the opinion of a myeloma expert. In 2005, the IMF hired me to help with its growing Support Group Program. Today, there is a network of over 150 myeloma specific groups in the United States and over 300 worldwide. The IMF has numerous programs specifically geared to ensure support and information are available at the local level. The IMF applauds the efforts and commitment of these groups and conducts an annual summit to offer help, training, and encouragement to support group leaders. When Michael was diagnosed, his treatment options were limited. Now that there are so many more options, people should feel encouraged to talk with their doctors about what’s best for them. How does your support group help new multiple myeloma patients? Michael: The first thing we tell people is to see a multiple myeloma specialist. Their local oncologists are treating many different cancers. Form a team with your local oncologist to work with a myeloma specialist. Myeloma is one percent of all cancers and a very individual disease; what works for one may not work for another. You still need a local oncologist, someone who can do your blood testing and know your history in case you need hospitalization close to home. But you want a multiple myeloma specialist as well. You want someone who is conducting clinical trials and knows the latest treatments and research. It should be a collaboration between your multiple myeloma specialist, local oncologist and other experts. You have a lot of people working for you that you need to coordinate — you’re the captain of the ship. 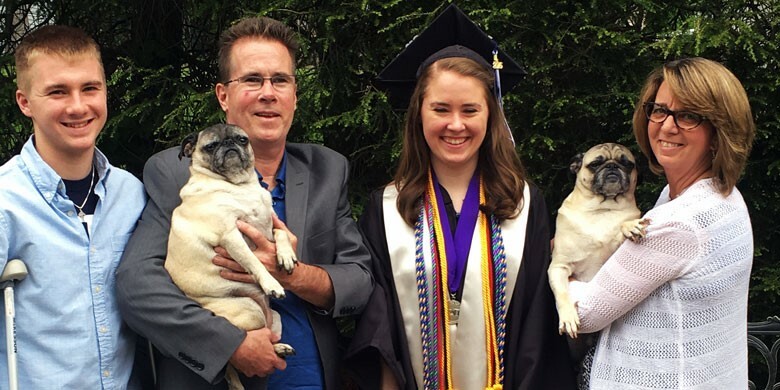 MULTIPLE MYELOMA SURVIVOR MICHAEL TUOHY (SECOND FROM THE LEFT) AND HIS WIFE ROBIN (FAR RIGHT) FEEL FORTUNATE THAT HE HAS LIVED LONG ENOUGH TO SEE HIS DAUGHTER ALLY (RIGHT) GRADUATE FROM COLLEGE. SINCE THEN, SHE HAS STARTED HER CAREER AS AN ELEMENTARY SCHOOL TEACHER, AND HIS SON MIKEY (FAR LEFT) HAS BEGUN HIS COLLEGE STUDIES AS A BIOMOLECULAR SCIENCE MAJOR. How does your attitude make a difference in living with multiple myeloma? Robin: We’ve never lived our lives waiting for the other shoe to drop. We’ve remained positive. You have to be confident in your doctor and the treatment that you’ve decided on together. Knowledge is power. Patients should learn as much as they can so they can have conversations with their doctors and remain engaged. How else are you giving back to the community? Robin: Our whole family has gotten involved in advocating for increased funding for multiple myeloma research, U.S. Food and Drug Administration approval of new therapies and oral parity laws. Those laws push for equal insurance reimbursement for anti-cancer treatments regardless of the delivery method. Michael was on an oral therapy at one point, so we know the benefits; it allowed him to go home, take a pill and get on with his normal routine. A silver lining to the multiple myeloma journey is seeing and appreciating our children become advocates and doing good things in the world. Our son Mikey is now in his first year of college, studying biomolecular sciences. Our daughter is an elementary teacher.